In the last few months we've seen some pretty astounding new developments in modern medicine, from fibre optics that can be used to heal the body to plasters that can measure your blood sugar levels and administer meds. 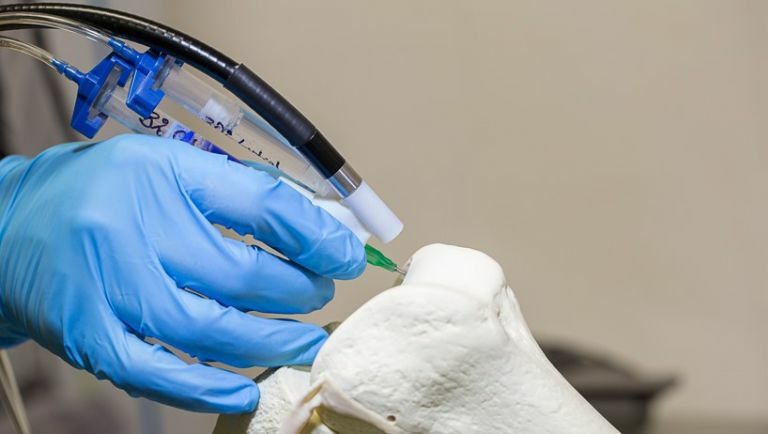 Now scientists have come up with a pen that can 3D print actual cartilage during invasive surgery. A team of scientists based at St Vincent's Hospital, Melbourne are the ones behind the 'BioPen', which uses an 'ink' of sorts made from a form of hydrogel and actual stem cells. Everyone's cartilage is different, and surgeons often don't know the exact shape and characteristics of a patient's cartilage until they're already performing surgery - with the ability to recreate this bio material via this process, doctors can apply these replacements with incredible precision. "The development of this type of technology is only possible with interactions between scientists and clinicians - clinicians to identify the problem and scientists to develop a solution," says professor Peter Choong, director of Orthopaedics at St Vincent's. The pen itself is built from a mixture of titanium parts and medical-grade plastics meaning its perfectly suited for use in operating theatres. Of course, at this stage the BioPen is still very much in the prototype stage but professor Choong and the rest of the team are hopeful it will eventually find its way into operating theatres around the world. Why not check out: Is there a future for 3D printing?